If there were a prize for the least obvious book cover image, I think this would get my vote. In the last 48 hours, I’ve stepped way outside my reading comfort zone. As a frequent book reviewer, I’m often asked to consider books that I’d never choose in a bookshop or library – unlike the Ladybird book pictured here, which I snapped up in a secondhand bookshop the other day for the sake of its bizarre cover, and because I adore vintage Ladybird books. Sometimes the publications I review for send me copies of books they particularly want me to consider, other times authors or publicists approach me on spec, after finding my name on Amazon’s list of top reviewers. Admittedly they have to trawl for quite a long way to reach me, as I’m currently ranked around the 1,400 mark. If they’ve got that far, I so admire their staying power that I’m likely to agree to their request for a review, provided they ask me nicely. There’s nothing that hacks off a book reviewer as much as an author’s assumption that sending you a free book entitles them to a review. Except authors who do that and then reel off a long list of sites on which they expect you to post your review, including some that you’ve never even visited. I therefore made it my policy long ago to keep an open mind about review requests, turning down only anything featuring violence or unnecessary tragedy. So it happened today that I found myself reviewing both a YA (young adult) steampunk thriller (sent to me by the debut author) and a collection of Polish poetry in translation (received from Vine Leaves Literary Journal, for which I’m a staff reviewer). Now, I have a lot of books in my house, including a floor-to-ceiling to-read bookcase in my bedroom. But until this week I didn’t possess a single steampunk thriller or Polish poem. In fact I only recently worked out what steampunk is. (If you don’t know either, check out the Urban Dictionary’s definition here). Although I enjoy poetry, and still treasure some of the poetry books I had from school and university, I’m not sure I’ve ever knowingly read a Polish poem. But what a joy these books have been to read, filling my imagination with new adventures and images, and changing the way I look at the world, just a little, as every good book should. It was also satisfying to write their reviews. Formulating a book review always helps me mentally digest what I’ve read. By doing so, I extract far more pleasure than if I’d just closed each book on finishing and moved on to the next one in my to-read pile without any further thought. I also gain pleasure from knowing that the book’s authors will appreciate my response. As an author myself, I know the warm glow that comes from spotting a new review of one of your books. Strangely, in the time it’s taken me to read and review those two books, two more new reviews have come in for one of my own books (Sell Your Books!, now with 42 reviews on Amazon UK, average rating 4.6*)) – not from the authors of the books I reviewed, but from two completely different readers. Is there some kind of book reviewer’s karma at work? To any writer who also reads books (as all writers should), that’s got to be a comforting thought. Whatever you’re reading just now, if you enjoy the book, take a moment to thank the author by leaving a quick review on Amazon, Goodreads, or any other site that you prefer. I guarantee you’ll make the author’s day. Previous Post Plopsaland – It’s Nicer Than It Sounds! I think this was a great post and something I try to do quite often. Reading outside of my “comfort zone” has opened my eyes to new and thrilling genres and ideas that I would have never been exposed to otherwise. I wanted to tell you all about a novel that has recently “gotten under my skin” so to speak. It is called “Human Source Code” by author Lubos Borik (www.lubosborik.com). It is a very original and thrilling novel about the possibilities of DNA manipulation and the power it could give over the population. An international organization is using “public health care” as a way to change peoples DNA and create “something” new. Detective Klapman sees a link between a group of seemingly unrelated deaths and begins to dig deeper. I love detective novels and also enjoy stories that involve future scenarios that are actually possible, so this one was right up my alley. In a modern world where our privacy seems to be less and less important, It left we with an uneasiness but also a feeling of wonder at what could be. Must read! If it wasn’t for reviewers like Debbie, willing to step out of their comfort zone, my book would probably never have received a review at all. If I had to classify Death on The Empress (and I did have to classify it for Amazon) then it fits snuggly into the Young Adult, Mystery/Detective story in a steampunk/alternative-historic setting – which doesn’t have a giant pool of reviewers crying out for more from the genre. So thank you, Debbie, for trying something new. I am going off right now to download something I have never tried before myself. My pleasure, Stuart – and I hope you find something exciting in the unknown out there! 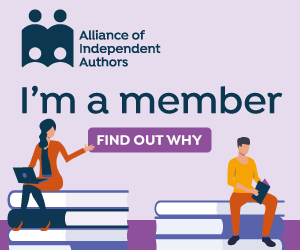 For many of the reasons you state above I assist the Historical Novel Society by being Managing Editor for reviewing Indie published historical fiction. In this case the HNS we aim to prove that Indie novels can be every bit as good as Traditional Published – in some cases, even better – by publishing honest reviews, with constructive criticism if needed. Thanks for adding this invitation, Helen – and with the wisdom of hindsight I should have added that one reason I joined the HNS Book Group in Bristol was precisely to take me outside my comfort zone! It has been great fun to be obliged to read a book I haven’t chosen each month (although I ought also to say that I haven’t exactly been forced to read any of them!) and I’ve discovered some books I really enjoyed. I’d been meaning to read Jean Plaidy for ages, for example, and joining HNS made me do it, and at that meeting we had a really interesting discussion about the changing nature of historical fiction since Plaidy’s heyday. So, folks, even if you think you won’t like historical fiction, do give it a shot – and help Helen out with some reviews! Yay for book reviews and reading out your comfort zone! I’ve started selecting books at random from our small library to broaden my horizon. Although I do have to be careful writing reviews for books that aren’t my usual genre because sometimes it can make me critical of elements (too much kissing!) that others love. And you’re right, nothing makes your day like a book review. It doesn’t even have to be five star – I’ve had one-star reviews that showed me the reader at least read my book (even if they hated it). I love the idea of selecting books at random from the library – maybe they should start a Lucky Dip tub to encourage others to do the same! You’re right about being cautious with reviews – if I ever have the inkling that I haven’t enjoyed a book because the genre is so way out of my normal range of choices, I leave an “it’s not you, it’s me” type of comment to flag up the possibility that it’s my fault I just haven’t “got” the book. I also take a glance at other reviews of the book, not so that I can follow the herd, but because I’m interested to know how other readers have found it. Reading between the lines of reviews can be fascinating too! I love reading between the lines on reviews (although I have to be careful they don’t warp my view of a book I love as I’m easily swayed!) If I get a bad review on one of my books I tend to glance through their other reviews for context. Some people just love those one-stars! You’re right there, Amanda! In fact I sometimes get side-tracked by following the links across from poor reviews of book, as the characters that jump off the page behind the one stars can be fascinating, even if only in the sense of being compellingly awful. I once had a poor review from someone whose profile revealed them to be a witch!! I clicked away from that page pretty sharpish – I don’t fancy having spells cast upon my books! But as witches aren’t my target market, I won’t let it worry me! Thanks, Helen – that was an excellent post!